The cards are all done! I finished making them while I was sick, and I wrote them out over Thanksgiving weekend. Except for a couple of address checks and international stamps they are ready to be mailed. So glad to get this done so early! 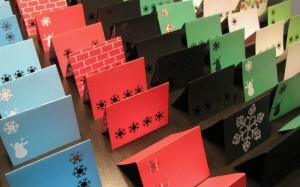 I’m happy with the cards, the die cut machine and Martha Stewart punches were fantastic. I kept it simple, no glitter or overdone greetings. Just clean design and a note inside. Now it’s time to get ready for our Christmas party on Saturday. Today I grocery shopped, and now I’ve got to start my make-ahead appetizers and things. It’s kind of slow now at the beginning of the week, but I’m sure it will be picking up major speed as Saturday approaches. I was going to pick up the tree today as well, but it’s pouring outside and not the most pleasant tree-shopping weather. Hopefully tomorrow will be better. I need to get a good night’s sleep tonight, I couldn’t fall asleep until after 1 last night. I won’t last too well this week like that. I had a ton of stuff to do at work today to catch up from my sick week last week, and I only got about half of what I wanted done. Weather and lack of sleep do not make me productive, apparently. Half the December displays are done, I shelved a bunch of books and sent my principal some needed updates. But the library tree hasn’t been decked out for winter, my desk is made out of paper piles right now, and I haven’t pulled any holiday books for displays yet. Here’s hoping my efficiency gets better.